It’s a Slow Cooker Borscht time. 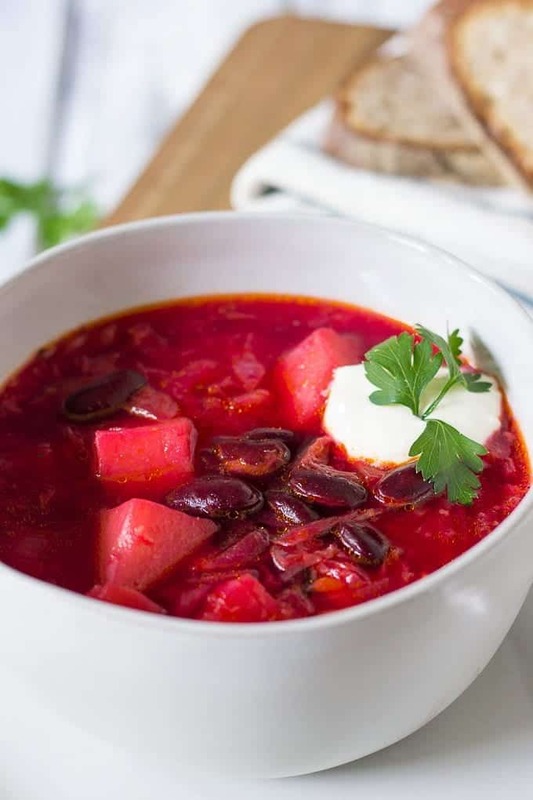 Classic Ukrainian Beet Soup doesn’t need a special introduction. It’s vibrant, hearty, healthy and absolutely delicious! No wonder, it’s on a weekly menu of every Ukrainian homemaker. This post may contain affiliate links! By clicking on them, or purchasing recommended items I may receive a small compensation at no additional cost to you. However, I only recommend products I truly love! See my disclosure for more information. This is the recipe that I make most often in my slow cooker. 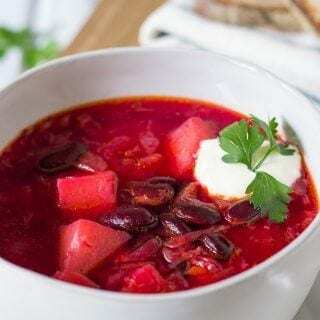 For me Borscht is quintessentially a comfort food soup. There’s nothing more pleasing than returning home from a day of chores and knowing that a big pot of homemade Borscht is awaiting for you. 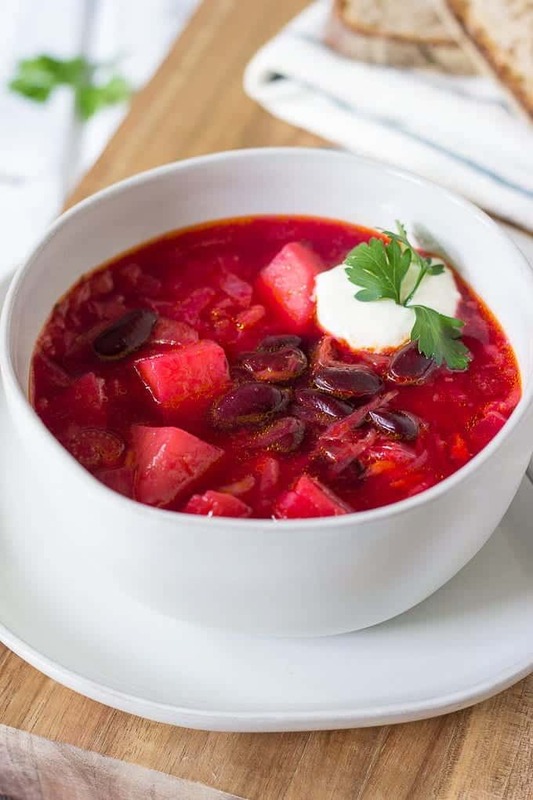 And although in Ukraine we eat Borscht all year long, it’s especially goes great in colder months when you just want a bowl of something warm and comforting. as I discussed in my previous Borscht post, Ukrainian Borscht tastes even better on the second day. So if you have a big family to feed, double the ingredients in my recipe to enjoy this classic Ukrainian soup for a few days in a row. Borscht is traditionally served in a large bowls with a dollop of sour cream and a sprinkling of dill/parsley or both. In Ukraine it is popular to eat Borscht with a dark rye bread, Salo, green onions or raw cloves of garlic. Absolutely. Ladle crockpot Borscht in a freezer-friendly zipper bags and lay flat in a freezer. Store Borscht in a freezer for up to 2-3 months. To defrost Borscht, simply transfer it into refrigerator and let it thaw for about 24 hours. When thawed, squeeze Borscht into a saucepan and reheat until it starts to simmer. French Parmesan Soup – another French soup that will fill your kitchen with warm and comforting flavors. Crockpot Chili – my famous Award-Winning Chili with a few minor tweaks and made in a Slow Cooker. Made my Slow Cooker Borscht? Snap a photo and post it on Instagram with a hashtag #lavenderandmacarons. I’d love to see your creations. If you like this recipe, please share it on Pinterest. I would greatly appreciate this. 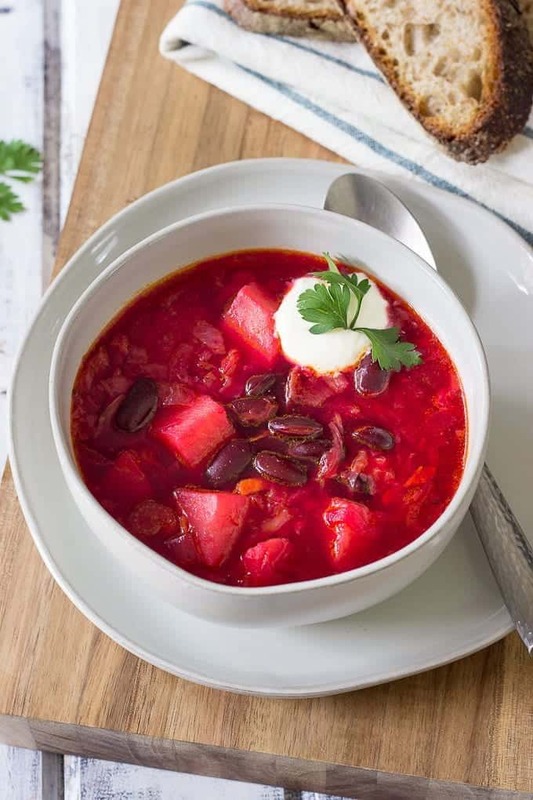 This Ukrainian Slow Cooker Borscht is so easy to make. Turn on your crockpot in the morning and return back home to a flavorful and delicious bowl of healthy goodness. Using a paper towel peel the skin and shred the beet on a large hole grater. Stir onion, carrot, celery, cabbage, potatoes, sugar, vinegar, tomato sauce and 6 1/2 cups of broth in a slow cooker. In a small bowl whisk together flour, the remaining 1/2 cup of broth, salt, pepper and add it in a slow cooker as well. Cover with a lid and cook on low for 7 hours or on high for 3 1/2 hours. When Borscht is ready, adjust the seasoning, add garlic pushed through a garlic press and chopped parsley. You can also steam the beets. Wash and cut beets in half. Place a steamer basket over a pot of boiling water and steam beets on a medium-low heat for about 15-20 minutes or until tender. Remove beets with the tongs, cool down and using a paper towel peel the skin. If your Slow Cooker has a "Browning" feature, I recommend sautéing the vegetables first. Set the Slow Cooker to "Brown". Add oil, onion, carrot and celery. Whisk it for a few minutes. Then, add 1 tablespoon of flour and whisk everything for another minute. Switch the mode to "Slow Cook" and add the rest of the ingredients according to the instructions below. I typically use Red Kidney Beans, however you can use Black Beans or White Beans. My mom also likes to slightly mash the cooked potatoes before she adds beets and beens. It gives Borscht more density. If you like your soups to be like that, take a regular potato masher and right in the slow-cooker mash the cooked vegetables 4-5 times. OK, this is going on the menu right away. I must admit that I’ve never had borscht before. I’ve sure heard of it and this recipe looks wonderful. Can’t wait to spoon it up!